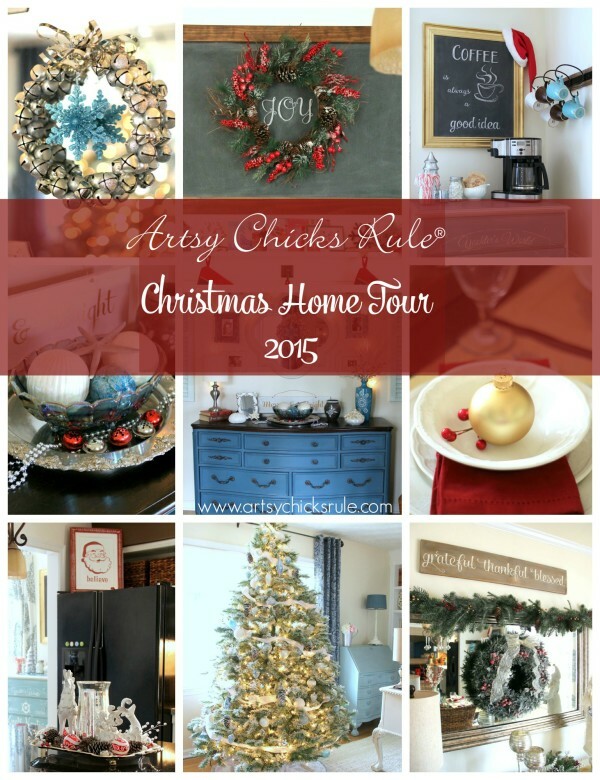 I’m back today with Part 2 of my Christmas Home Tour. I’m feeling so light without the added weight of some of the furniture these rooms used to have. AND we even cleaned (we…he, my husband ;) ) out the garage. It’s empty and is a space I can work in sometimes now. Now onto the rest of my Christmas decor. 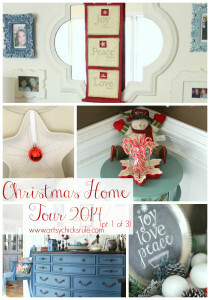 As I had mentioned in Part 1 of my Christmas Home Tour, I kept things a bit more simple and neutral this year. Looking to the left from the foyer is the study…. ….and dining in the back there. I found this tree at the thrift store and flocked it. 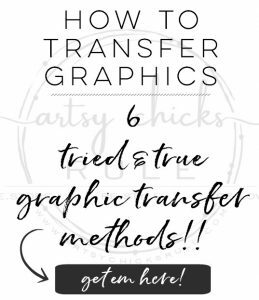 You can see that tutorial —>>here. Since it had “freshly fallen white snow” on all the branches, I decided to keep it very clean and light. 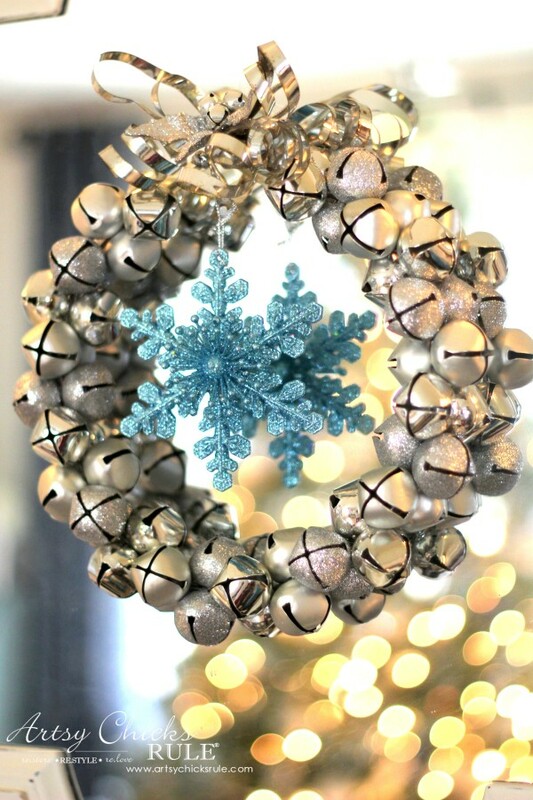 I used silver, white and aqua ornaments with a white felt ribbon wrapped around it. 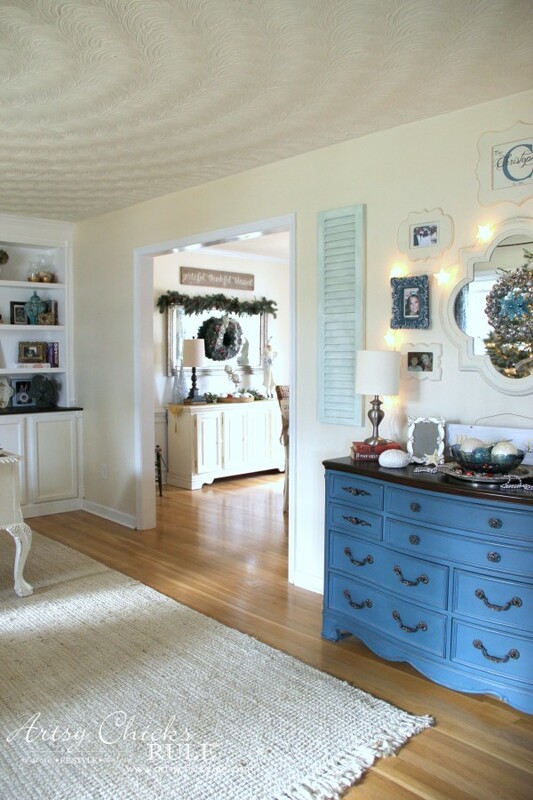 The colors in this room are mostly blues and whites, off whites, so it goes beautifully in here. 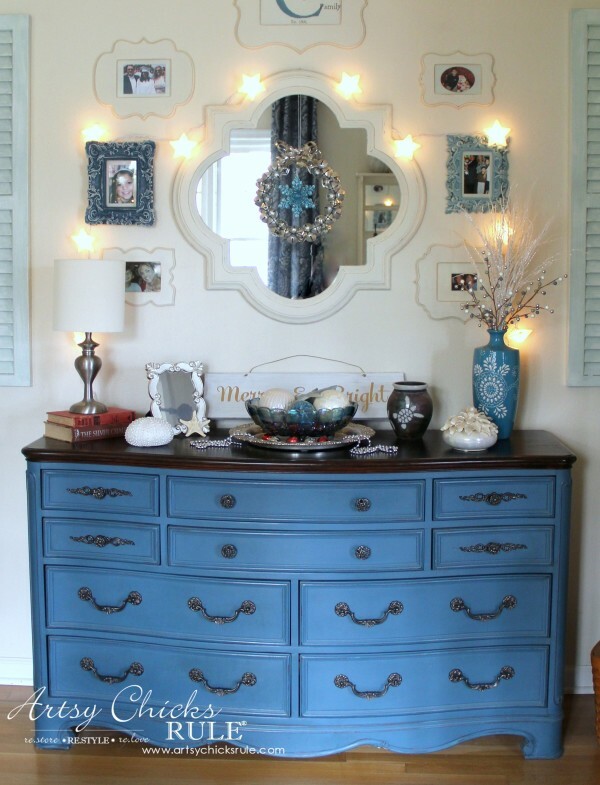 My Aubusson Blue Dresser is always fun to dress up. I didn’t do much but did add a few red bells in the tray for a hint of red. Oh, and the star lights came from Target. Aren’t they sweet? 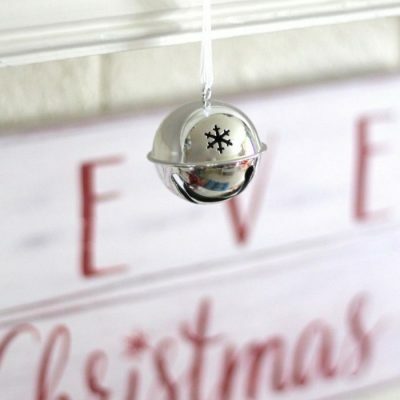 This year it’s hanging on my mirror over the dresser with a pretty blue snowflake in the middle. Aren’t the lights from the tree so pretty in the reflection? The pillow below was one I painted with Chalk Paint® a few years ago. 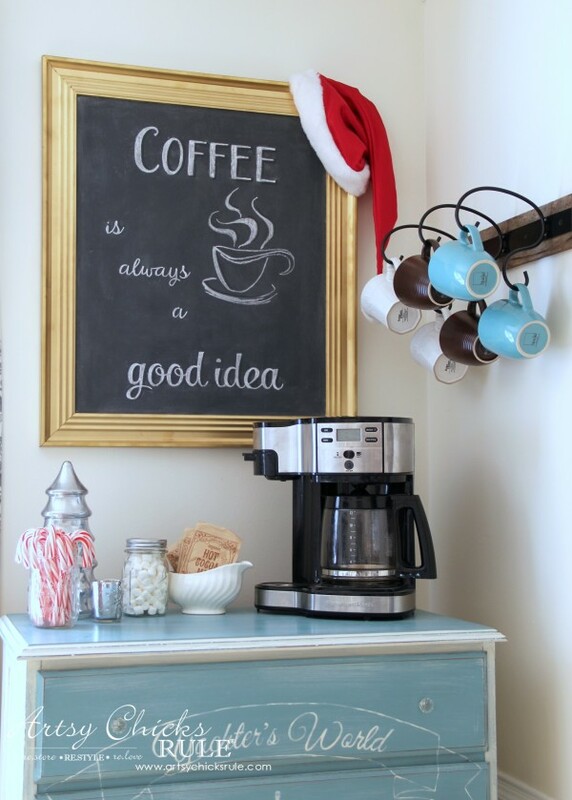 The “It’s a Wonderful Life” sign is a Pottery Barn inspired sign I made a couple years ago. I put it over my hall tree this year with a couple over sized ceramic ornaments I usually use on the porch. 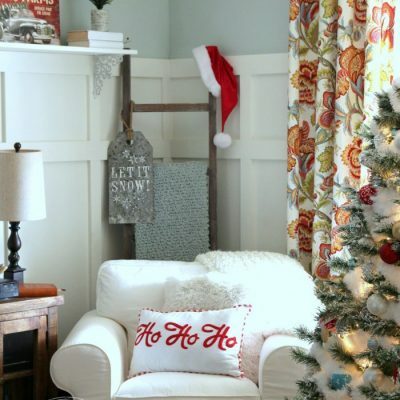 So I do have a few pops of red in this otherwise blue and white room. The “Santa Claus Lane” sign was a thrift store find last year, I think. The “Peace on Earth” bowl was a metal bowl I found at the thrift store a few years ago…and painted! 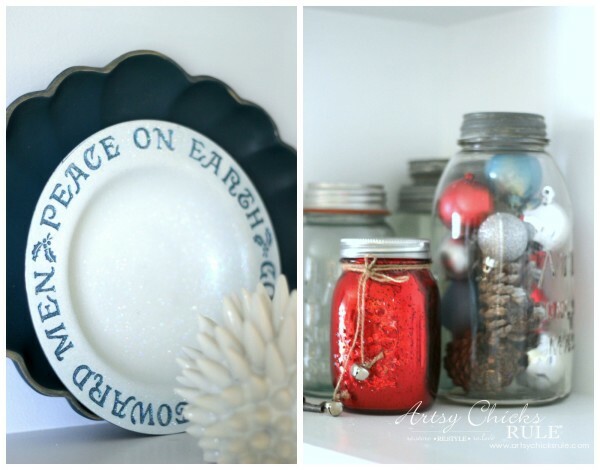 I filled some of my blue Ball Mason jars with ornaments and pine cones. On this side of the room I have a Victorian era hall tree from the 1870’s. 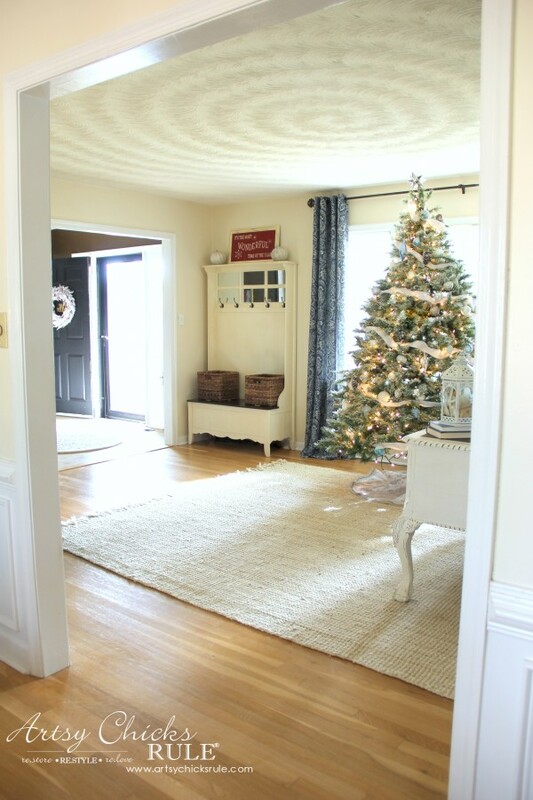 I’m thinking this hall tree was original to the home! What a find for $85. It does need a few repairs but the wood is still in beautiful condition. It just needs a good cleaning and polish. The trays at the bottom were replaced with round (cheap) brass ones. 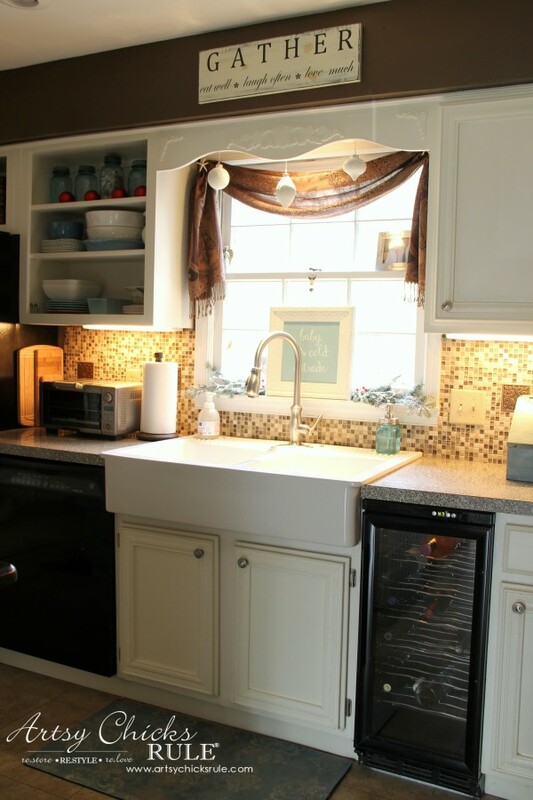 I would LOVE to find the original scalloped ones that belong there. 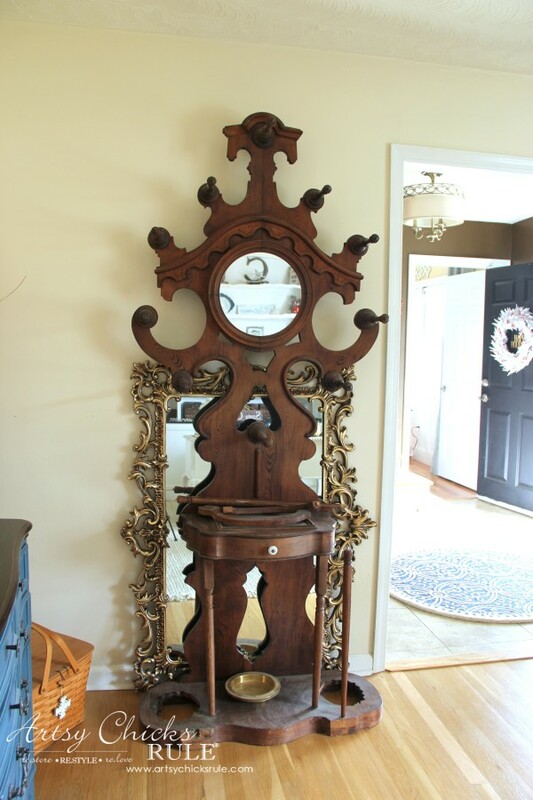 The beautiful ornate mirror behind it was found just a week or so ago for $20 at my local thrift store! I shared both of these on Instagram at the time I found them. Looking back towards the front door from the dining…. You can better see the hall tree with the sign above. And looking into the dining…. I decided to use the burlap chair wraps again this year. They are just so pretty and really dress up the chairs. 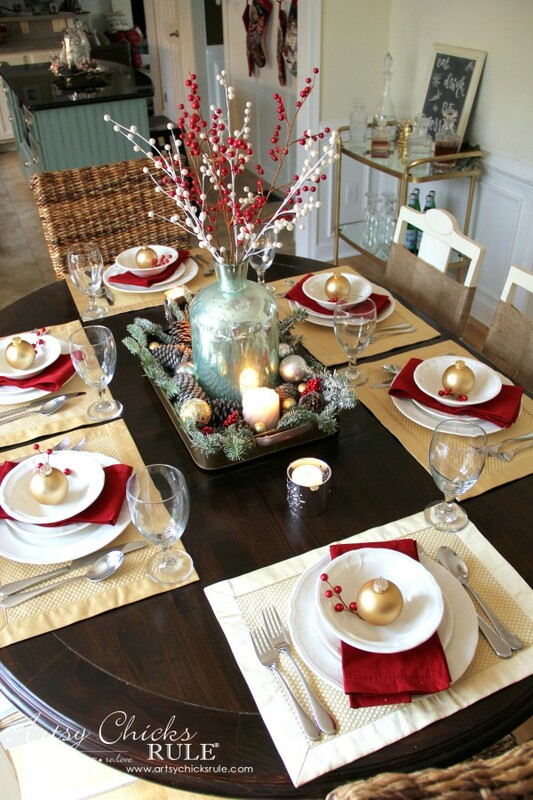 I also decided to create an festive table setting with gold and red…. The aqua vase is from At Home. 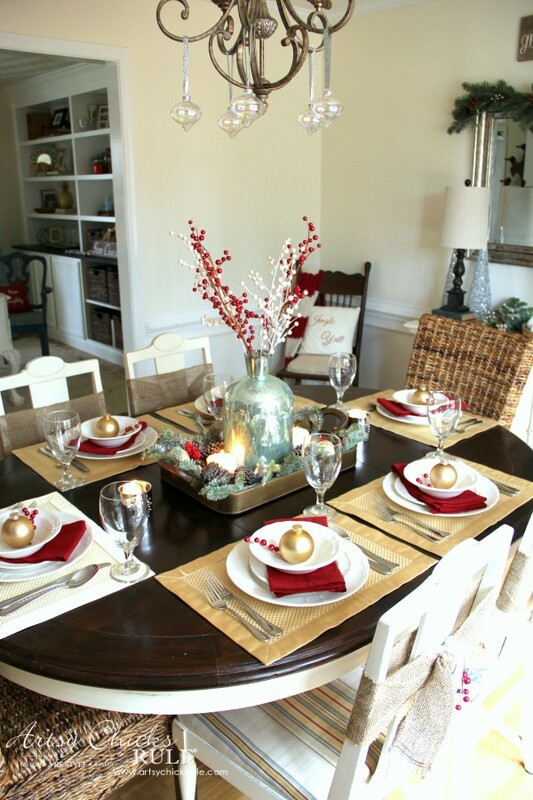 I decorated it simply with ornaments, fresh greenery & pine cones, berries and candles. 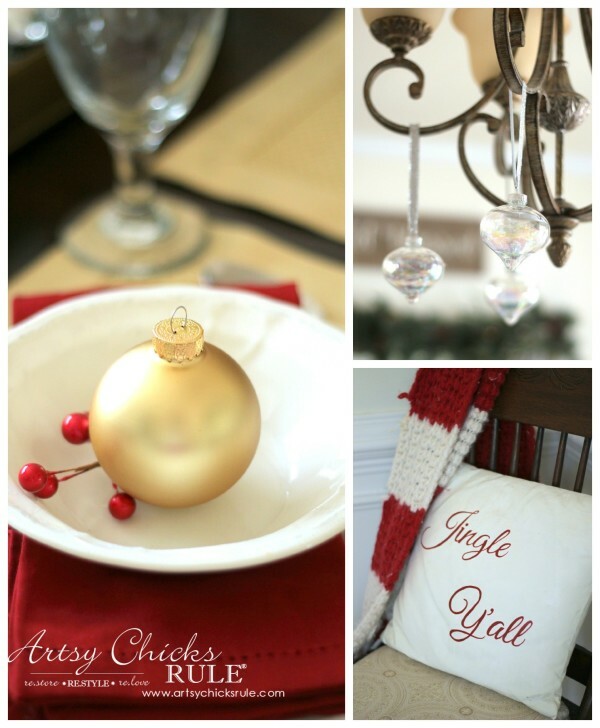 A simple gold ornament and red berries dress it up a bit. The clear, iridescent glass ornaments hanging from the light came from Big Lots, 6 for $5! 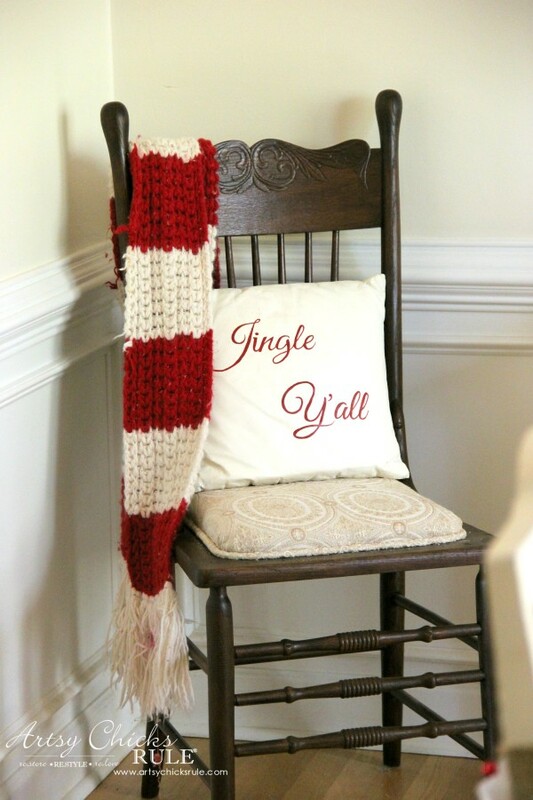 The “Jingle Y’all” pillow is another Chalk Painted® pillow sitting in a thrifty chair I also made over. I am still really loving these curtains from TJ Maxx. 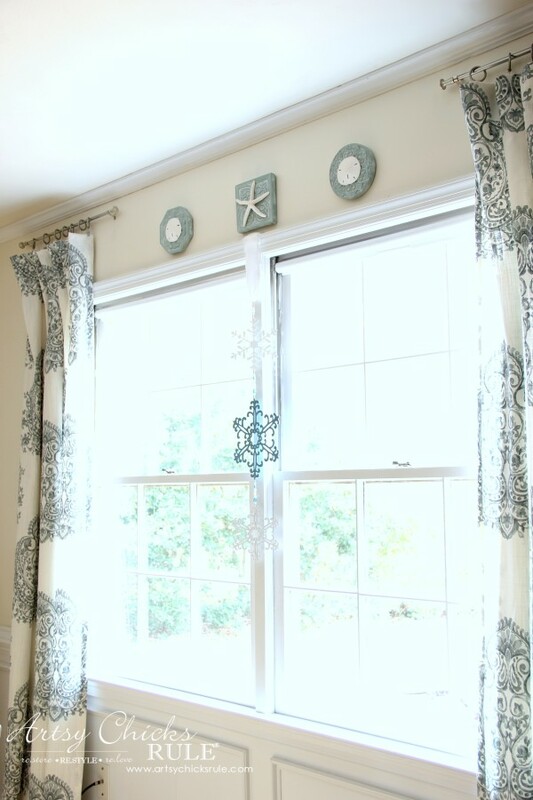 I hung my “DIY Snowflake Wall Hanging” in between the windows here. I sprayed them gold and look how elegant and beautiful it made them. 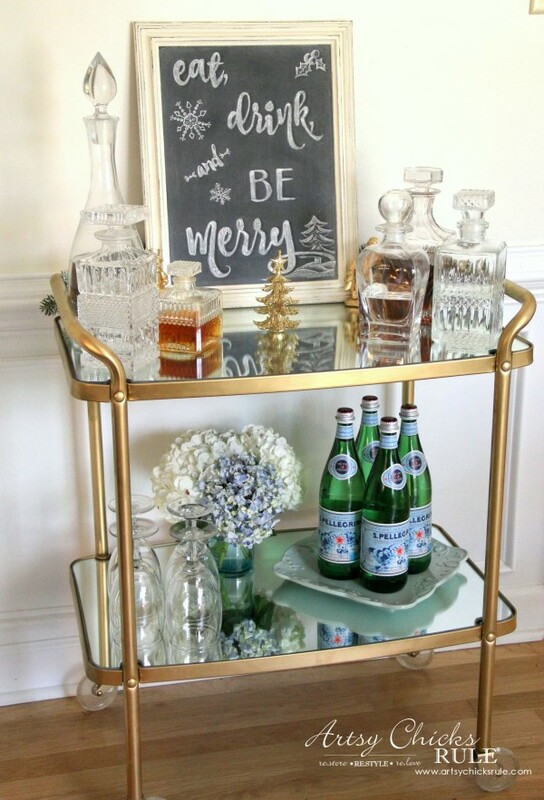 They are on the “new” beverage/bar cart with the chalkboard and chalk art I just created. I’m also loving the smaller coffee bar here. Everything needs a Santa hat on it, don’t you agree? I created a little cocoa station with cocoa, candy canes and marshmallows. The coffee mug rack is new. I ordered it from Amazon but in trying to share the direct link for you, have found it’s currently not in stock. I will try to check again and edit, if possible. It’s only the metal portion, however. I wanted it to look a bit more rustic so added a piece of old pallet board. 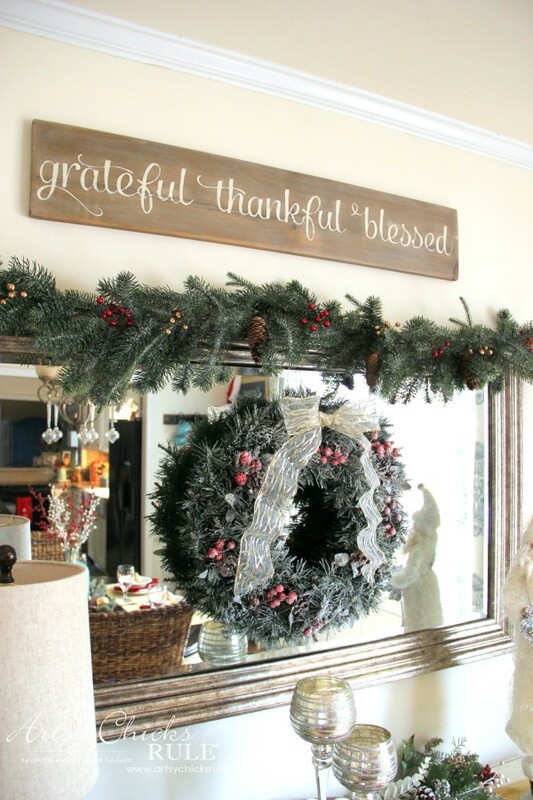 The “grateful, thankful, blessed” sign can be found –>> here. Again, I kept things a bit more simple this year. 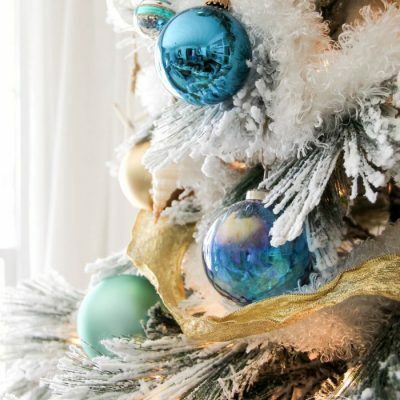 Silver trees, some greenery, candles and ornaments (and “snowballs”). 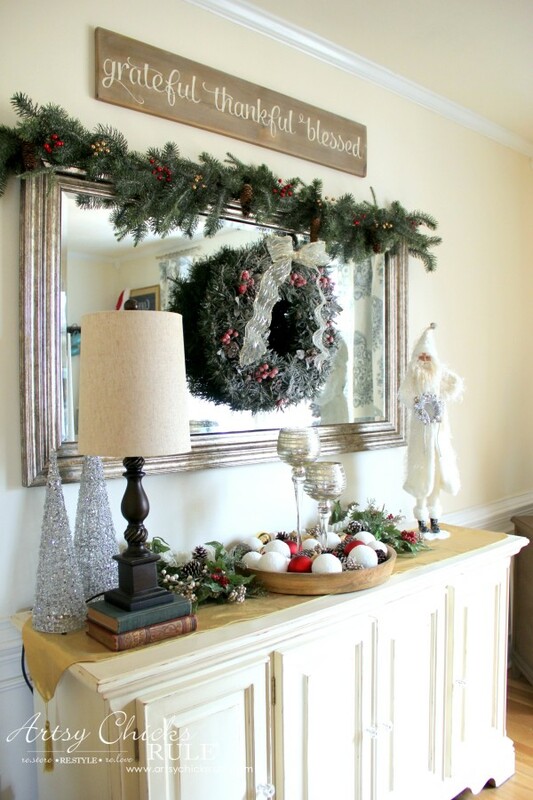 The wreath is one I also made and then flocked. The greenery at the top of the mirror is from Michael’s. I added some gold and red berries to dress it up a bit. I love the more natural look of the decor here. The kitchen island got these whimsical deer (Michael’s). Sitting on a metal tray from the thrift store filled with pine cones and ornaments. 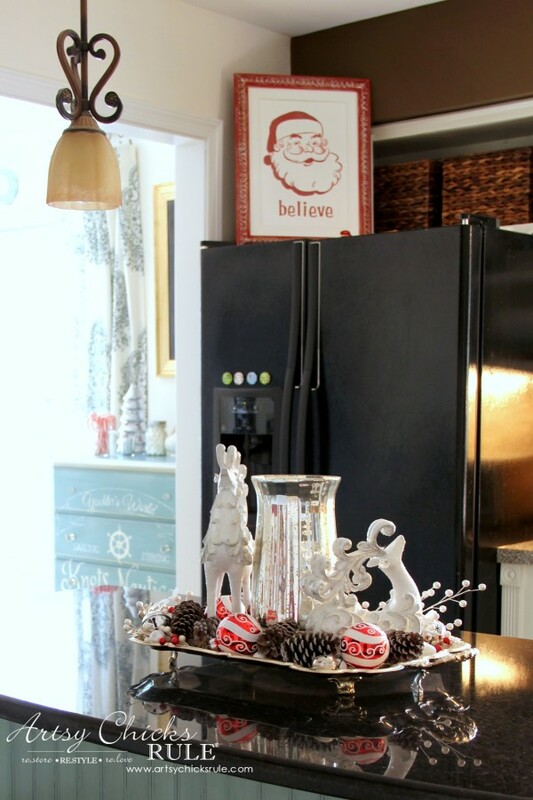 The “Santa Believe” sign is up on the refrigerator this year to welcome all who enter. That jolly face just makes me happy! 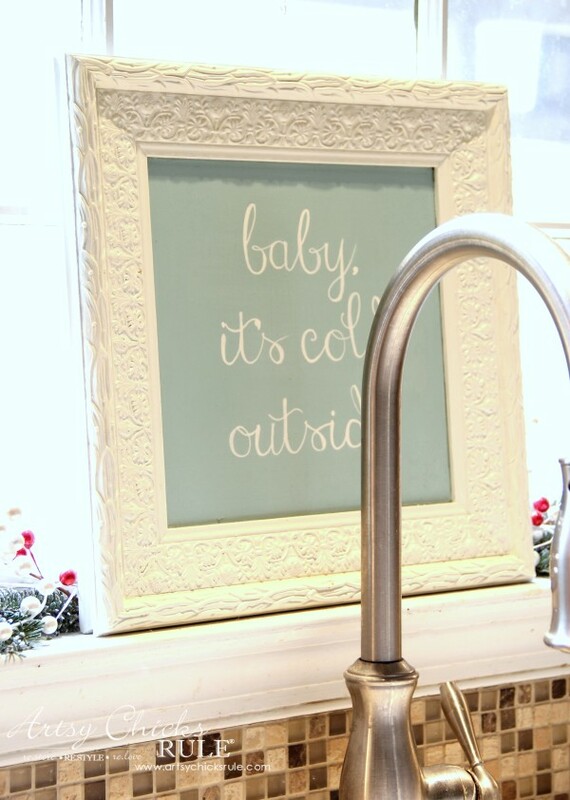 I hung three cream colored ornaments from the top, some fresh greenery on the window sill with berries…..
…and this “baby, it’s cold outside” sign. 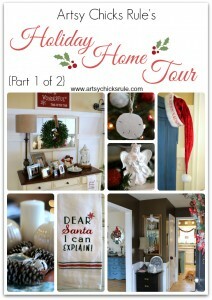 Not much over here except you can see the wreaths on the shutters I shared with you in Part 1 of the tour. And I did add a bit of greenery and berries on the bar top there. A red hand towel that says “Calories Don’t Count at Christmas”. And ya’ll!!!!! 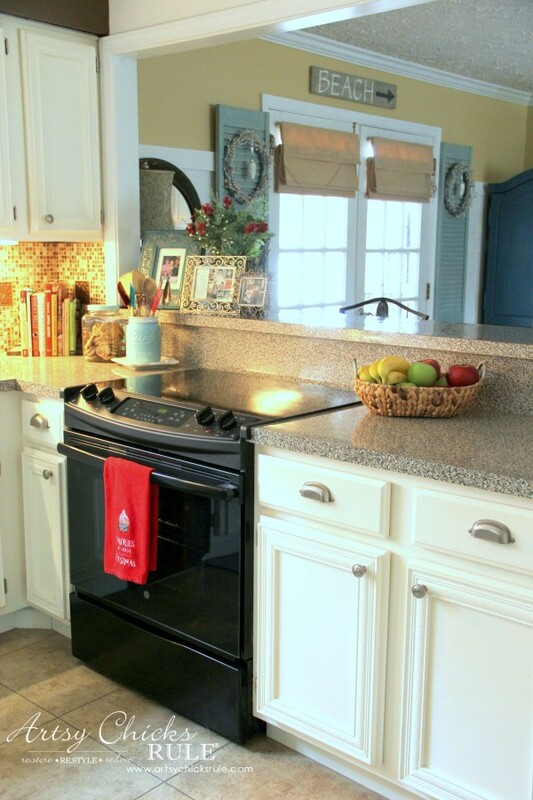 That is a NEW stove!! Oh my gosh, do you know how long I’ve wanted/needed one? The old one wasn’t broken but it was old and awful, rusty in places, didn’t fit the space well, was white (everything else is black). And it looked dirty no matter how much I cleaned it..ugh! Still, I had a hard time pulling the trigger on spending that money since it was working but when the washer went out….done deal!! Haha…that’s what happens when you go shopping for appliances and you have to buy. You also might remember me saying things are changing around here. Well, I also changed the main gallery wall decor too. 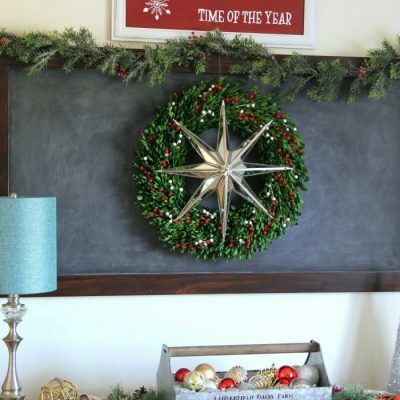 Yep, all the rest is gone and in it’s place is this perfectly rustic, farmhouse styled chalkboard. The ledge is quite full of Christmas cards since taking this photo. I usually line them up along the bar top but thought the ledge here would be perfect. They look so pretty lining it down the length of the wall. 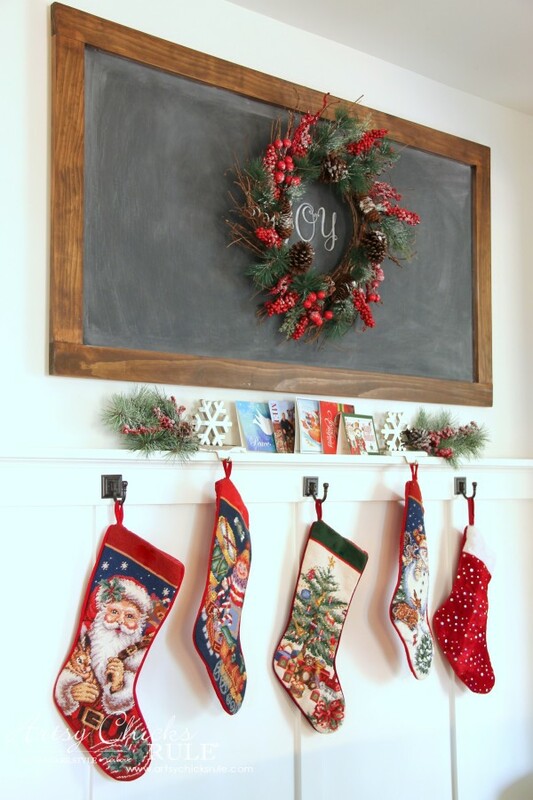 And in case you were wondering, this is where I decided to hang the stockings this year. Until Christmas morning, of course, when Santa fills them and lays them back over at the fireplace. He is okay now, he is my one that does not like change. 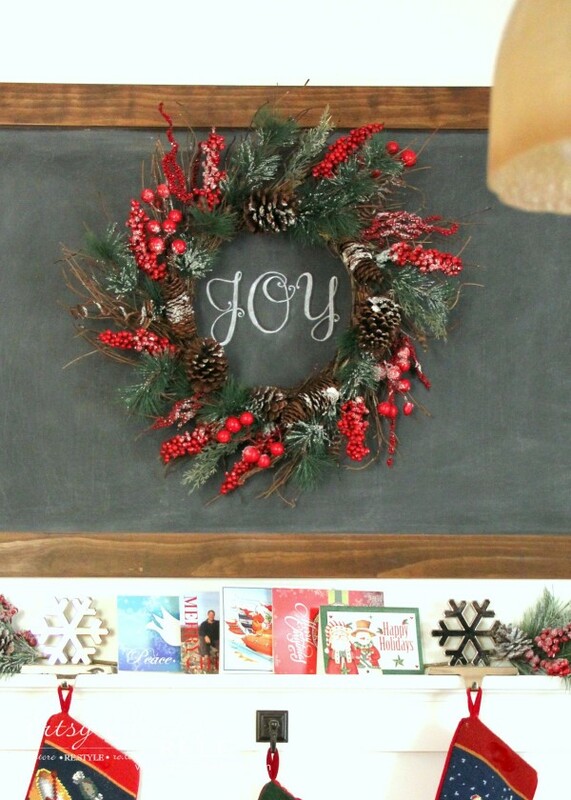 A little “JOY” chalk lettering in the middle….and I’ll have more on this DIY chalkboard in the new year. 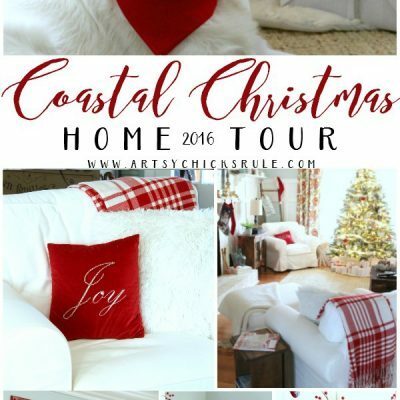 Well, friends, that concludes my Christmas Home Tour. 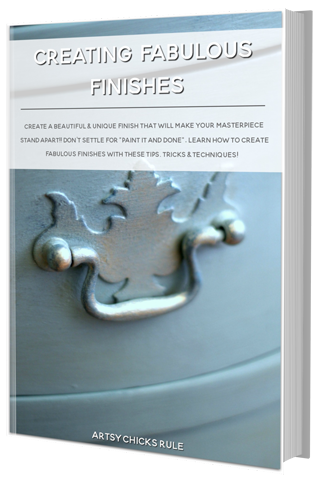 I’m so happy to have been able to share it and all of the thrifty decorating tips with you. 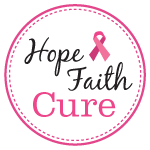 If you missed Part 1, you can see it –>> here. 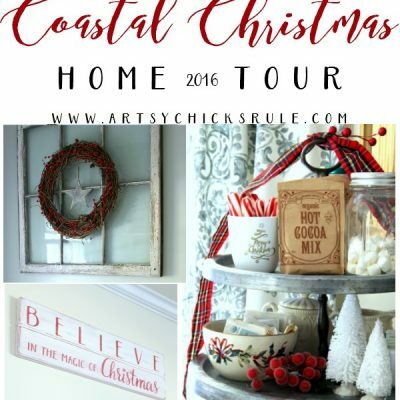 If you’d like to see previous years Christmas Home Tours to see how differently I used all of these items, you can visit them here. 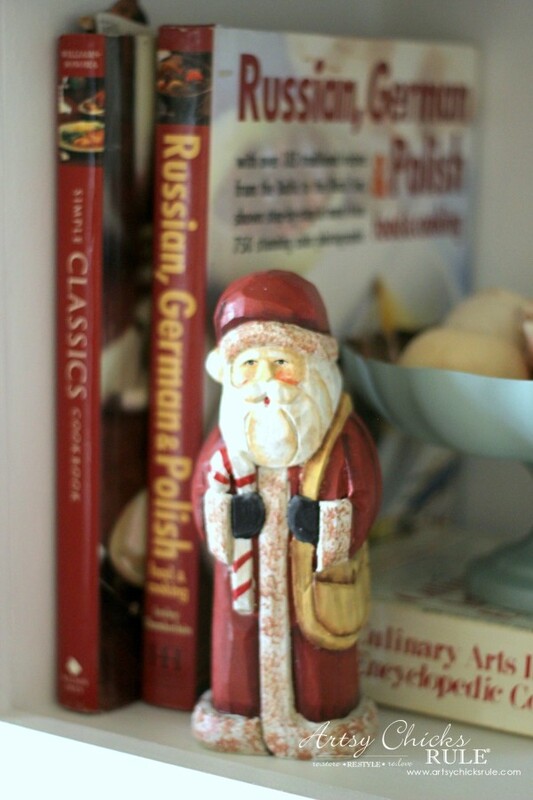 I’ll be back on Saturday with a bunch of holiday recipes for you, just in time for the holidays! I hope you have a very Merry Christmas and Happy New Year too! Hope you and the family have a wonderful and Merry Christmas!! I haven’t really even had a chance to enjoy it much since we only recently finished in there. 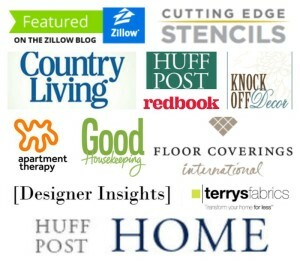 I’m looking forward to getting out of my upstairs office/room every once in awhile and blogging from there! Everything is so lovely, Nancy! I love the beautiful colors in your house! 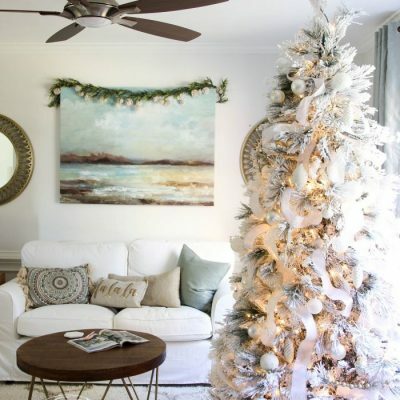 And of course, I am still loving your flocked tree! 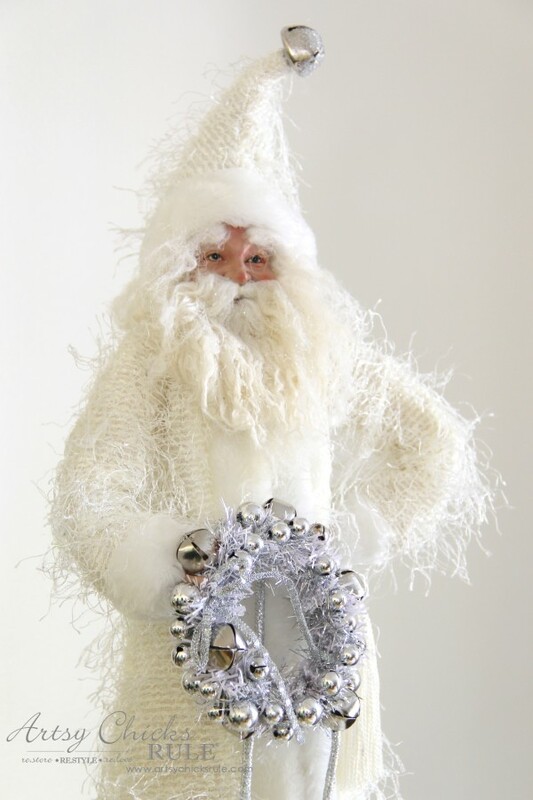 (And your sassy Santa!) I’m looking for a smaller tree to flock, but so far, no luck. I’m keeping my eyes peeled! 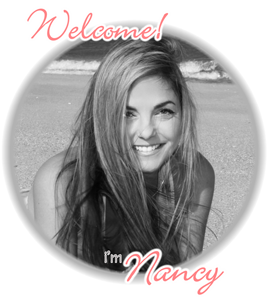 Your house looks beautiful Nancy! 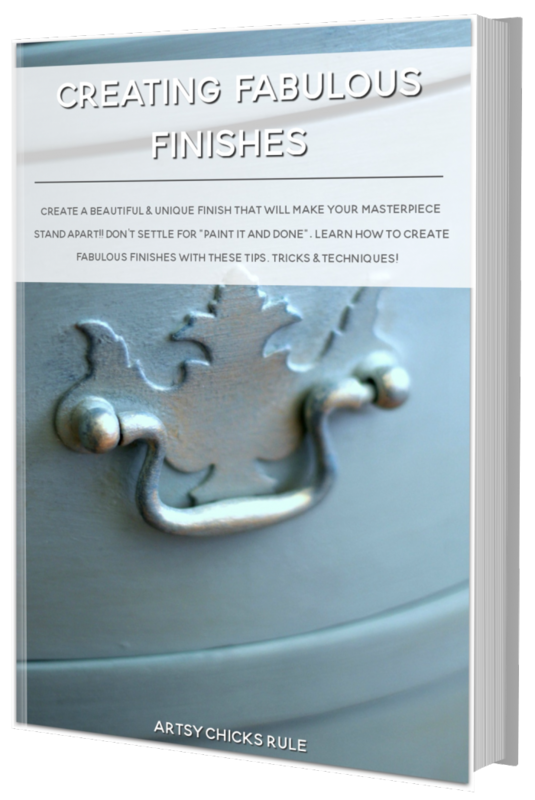 Oh my gosh, that antique hall stand is stunning – how lucky to find such a fabulous piece. 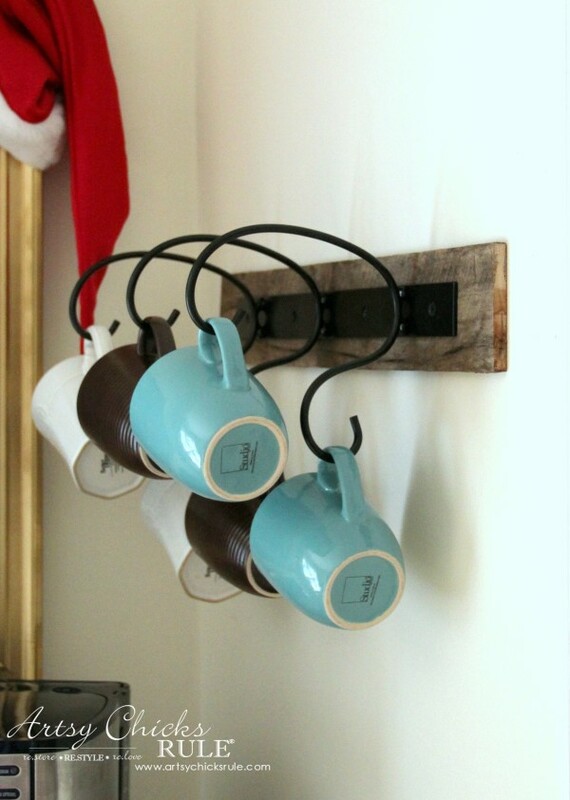 I want that rustic mug rack for my daughter, going to keep my eyes peeled on Amazon for that one. 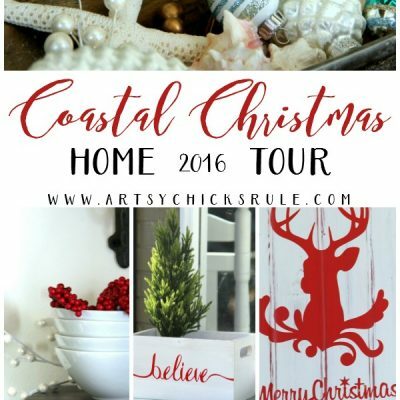 Your bar cart is so awesome too but what has me swooning the most is your gorgeous den/study – from the built-ins to the desk in the center, the flocked Christmas Tree, and the large window filling the room with light. Yes, I have no clue where that stand will go but hoping to use it in the new house whenever we move. 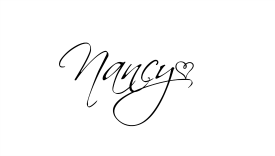 Everything looks just perfect, Nancy! 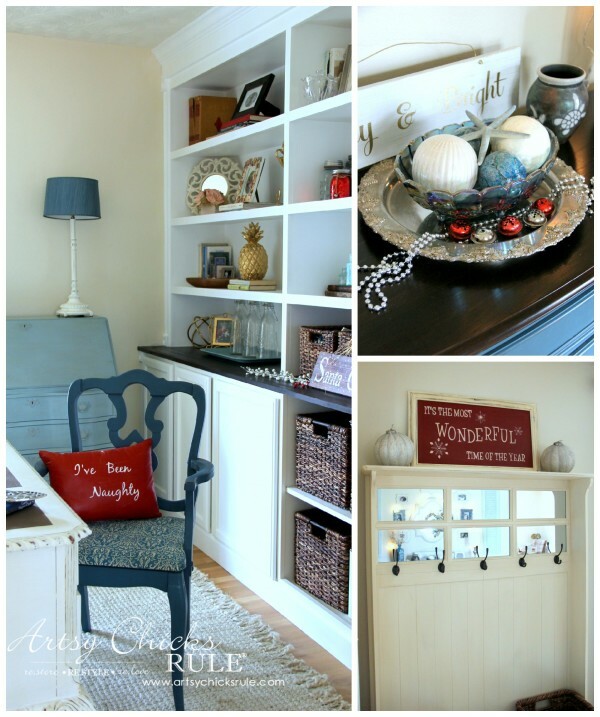 I am in love with your office and those built-ins!! What I wouldn’t give to have a space like that! 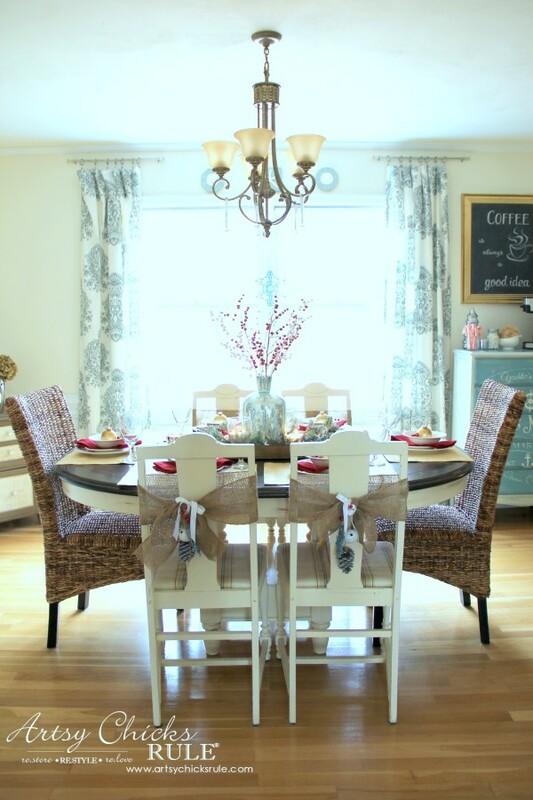 Your dining room looks gorgeous too and yay you finally got a new stove! You should have included a photo of the old one so people really understood what it meant for you to have a new one ha ha. Absolutely beautiful from corner to corner! haha, it’s in the old holiday tour photos. They can see it there. Ick!! No close ups though! Poor old thing! I love it ALL!! 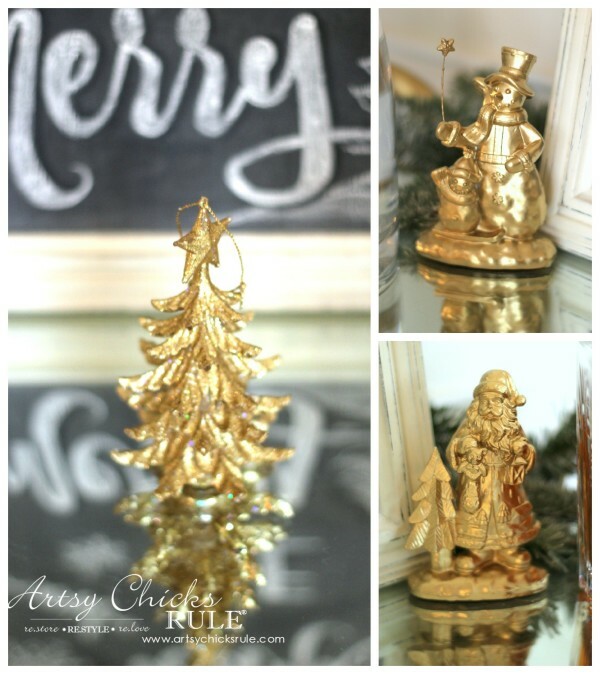 Especially the Dining room and your flocked tree!! Btw, there are mug holders like yours on eBay. Oh, that’s good to know!!! Thanks for the tip! Gorgeous!! I love it all!! You did an amazing job of decorating!! I love all the little touches you added all over. Beautiful!! Thank you so much! 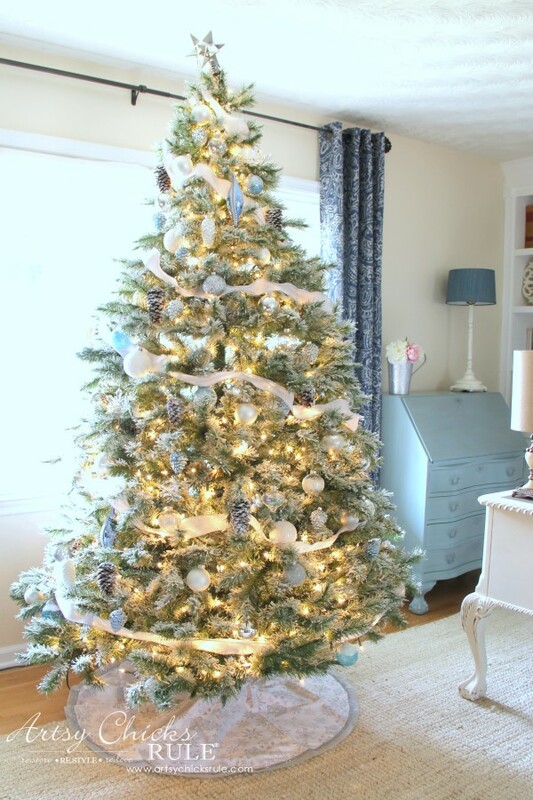 :) Blue is my favorite and I just love using it in my home. I’m so sorry for the confusion on the hall tree. I was just saying the wood was still in very good condition.